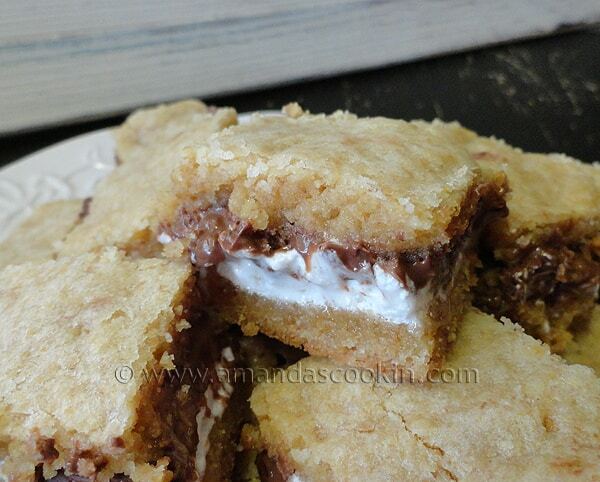 First let me tell you how amazing these S’mores Bars are. 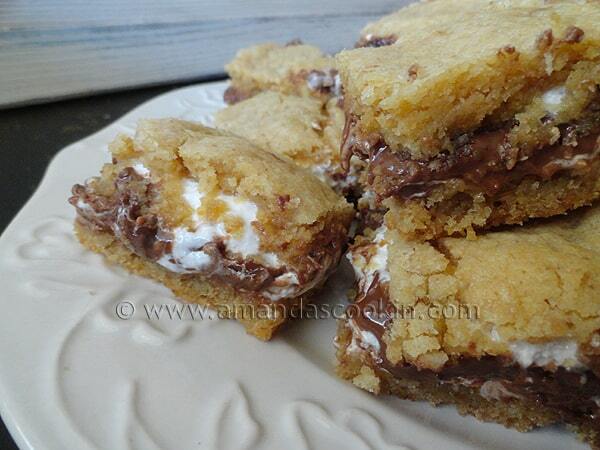 They taste just like s’mores but in bar form, which means they are portable. That of course means you can take your s’mores with you! Yum! 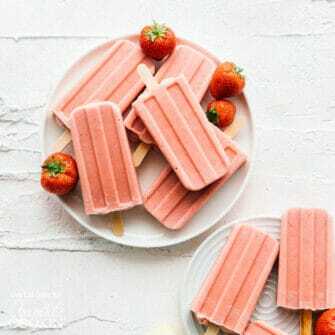 These make a great treat for a slumber party or just anytime. Dana has lots of marvelous recipes and I was actually having a tough time deciding which one to make when I came across these beauties. However, and not by any fault of Dana’s but rather my own, I ended up having to make these three times before getting them right. Several old sayings came to mind too – “third time’s a charm” and “if it ain’t broke don’t fix it”. Let me explain. First of all, I didn’t have any marshmallow creme as it’s just not something I usually buy. So I googled a recipe on how to make it. Too much trouble, more than I wanted to bother with. Then I found a post on a message board that said you can heat marshmallows and a little corn syrup together to make homemade marshmallow creme. Cool! So that’s what I did. So the first attempt with the homemade marshmallow creme was actually fine, but putting the top layer of dough on was really challenging. Spreading is not exactly an option, so I tried pressing it with my fingers and layering it on like cobbler. I didn’t have chocolate bars either, so I used chocolate chips. Well, while that tasted amazing (in fact I preferred the flavor with the chocolate chips over the Hershey bars), it didn’t work too well. The chips don’t provide a blanket on the marshmallow like the bars do, so the marshmallow bubbled up too much and then because of the shingled topping, it seeped through the cookie layer. Ugly (VERY ugly), but magically delicious. 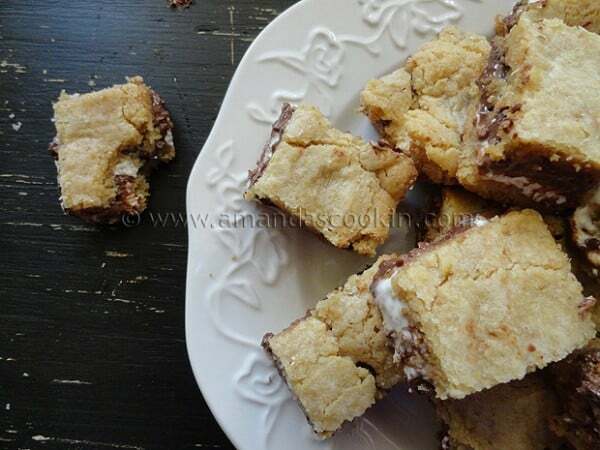 So I decided the second time to make sure I had chocolate bars, and again I used the homemade marshmallow creme. This time I allowed the marshmallow to cool completely and I sprayed the bowl I kept it in with PAM, so it slid right out. However, this time I didn’t actually measure the graham cracker crumbs, I just used the “6 sheets” as indicated in the recipe. So that made my dough a bit dryer. I pressed on though. I baked them for 30 minutes and they were over done. The other mistake I made was to tuck the dough in and it was too tight. Underdone in the middle, and over done on the outside. GAH! What the?? 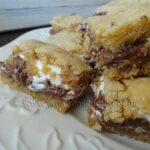 So finally, after all of my mishaps I can happily report that I bought a jar of marshmallow creme, made sure I had chocolate bars, and developed a nifty way to add the topping, resulting in perfectly marvelous S’mores Bars. And so I share with you, my lightly tweaked instructions for this amazingness. First off, after making the cookie dough, divide it in half. I’m obsessive and use a kitchen scale, you don’t have to, but it would probably make me feel better if you did. ;-) now take a piece of waxed paper and turn your square pan upside down. Put the waxed paper over the pan and press one half of the dough on to the waxed paper. Work it until it’s the shape of the bottom of the pan. Lift the waxed paper with the dough on it and set it aside. This will be the topping. Now turn the pan over and press the other half of the dough evenly into the bottom of the prepared pan. Spread the marshmallow creme over the dough layer in the pan. Don’t spread it all the way to the edge. After layering the chocolate bars over the marshmallow, turn the waxed paper with the dough on it over the bars. Peel off the waxed paper. Preheat oven to 350 degrees. Lightly grease an 8-inch baking pan. In a large bowl, beat butter and sugar with an electric mixer until creamy. Add eggs and vanilla; beat until combined. In a small bowl, combine flour, graham cracker crumbs, baking powder, and salt. Add to butter mixture, and beat until combined. Turn the baking pan upside down and place a piece of waxed paper on top. Press half of the dough onto the waxed paper, using the bottom of the pan as a guide for the size. Set aside. Turn pan back over. Press the other half of the dough evenly in the bottom of the pan. Spread marshmallow cream over the dough, but don’t go all the way to the edge. Lay the chocolate bars on top of the marshmallow creme, breaking apart as needed to create an even layer of chocolate. Take the preformed dough that you set aside earlier and invert onto the top of the chocolate and peel away the waxed paper. Spread gently to the edges if needed. Bake for 25-30 minutes (mine was 27). Cool completely before cutting into squares. To make your own marshmallow creme, over low heat melt 7 ounces (about 4 1/2 cups) of miniature marshmallows and 3 tablespoons of light corn syrup. Let cool in a bowl sprayed with cooking spray. marshmallow creme will slide right out when you are ready to add it to the recipe. Yep……..no one could stop eating them. Awesome! These bars are amazing! I always get requests to make them, everyone loves them. Is it my imagination, or are S’mores the new cupcake rage? So far,this is the best recipe version I’ve seen. The gooey marshmallow and melted chocolate is really making me drool. Absolutely fantastic tutorial, and very genius way that you made these work. I’m so hoping to find time to make these– and promptly give them away. They do look rich and very addictive. I agree, they are the newest rage, I see s’mores stuff everywhere! As always you just go crazy and something out of this world – this looks fabulous! I gave up marshmallows when I became a vegetarian….this recipe makes me miss them more. Mmmmmm…. S’mores in a bar. Be. Still. My. Heart. I HAVE to make these. And I dont’ need a fire to do it. YAY!! First off: These look super duper yummy. Second off: I’m so glad you said that these are good anytime, because that’s pretty much when I always eat my dessert. Now I know the first cookies I’ll make when my older son comes home to visit from college next time! mmmmmmmmmm they look fantastic! Third Times a Charm! 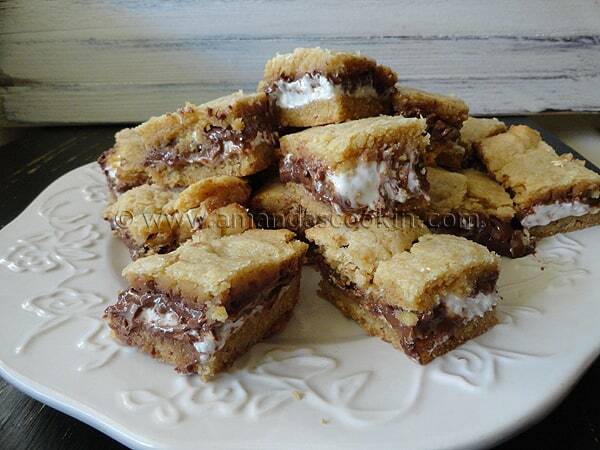 This is similar to a recipe for S’Mores bars that I love! One look at your bars and I melt like the marshmallows in them.